THAT gate.......it just won't go away! When I was elected last year, I promised to try to persuade Churchmanor Estates to re-open the infamous "Wilkinsons Gate" and you may recall I was told it would stay closed on safety grounds. If you refer back to June and July 2010, on this blog, you can read all about it. 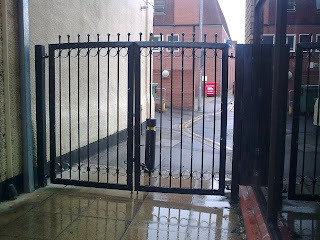 I feel that this issue will never go away, as long as Churchmanor - a company professing to have the interests of OUR town centre at heart - keeps this gate closed. They will certainly win no fans by keeping it closed. Today, I read on the Hunts Post website about the stationers, Colemans'. This shop's name was "used" by Town Centre Manager, Katy Sismore when telling us all how the town centre was "cutting the mustard" after a small business opened in premises above the present Colemans shop. Colemans are moving to a smaller unit. Declining sales prompted Colemans’ contraction into its smaller premises, but managing director Joanna Patterson-Gordon said the firm remained “totally committed” to continuing its 30-year presence in Huntingdon. “We traded very successfully in Huntingdon until the gate (to St Germain Walk) went up – that had an impact overnight. It was like turning a tap off. Sales have been declining since,” she said. I think this issue needs revisiting. And soon. So why is the gate there? Churchmanor told me (the letter is shown in full on the July 2010 blog pages) that the gate was closed, and remains closed, on grounds of health and safety. I have lost count of the number of people who have told me that they just don't believe it's just that, and one prominent member of the business community told me "we all know it was done to drive pedestrians past the Churchmanor properties such as Starbucks and Vision Express." I can fully appreciate why Katy Sismore "talks up" the situation regarding the High Street, and whist the new "Barney's Plaice" looks quite smart, we still have a plethora of empty shop units. HDC has plans to build a £3 million multi-storey car-park, and when Sainsbury's moves up near the station, the idea is that three or more "recognised retail outlets" will move onto their present site. If we aren't careful, though, we'll have a High Street containing just opticians, estate agents and mobile phone shops, which already make up around 20% of the shops in town. Anything that can be done to breathe life into the town centre should be done, and whilst it will be VERY late in the day, surely Churchmanor can help by taking that gate down. I'm sure most people are perfectly capable of looking after their own health and safety. I’d love Mr Cameron to have a word with OUR Council, because as has been well publicised, HDC plans to cut voluntary grants by 81% in two years – and the biggest recipient is Huntingdonshire CAB. I never thought I’d say this........but I agree with Eric! In my view, HDC is being short-sighted, and whilst a review later this year may go towards a reduction in these cuts, a firm commitment to look more closely for other savings would give the voluntary sector more security.